Looking for a new vegetarian favourite? 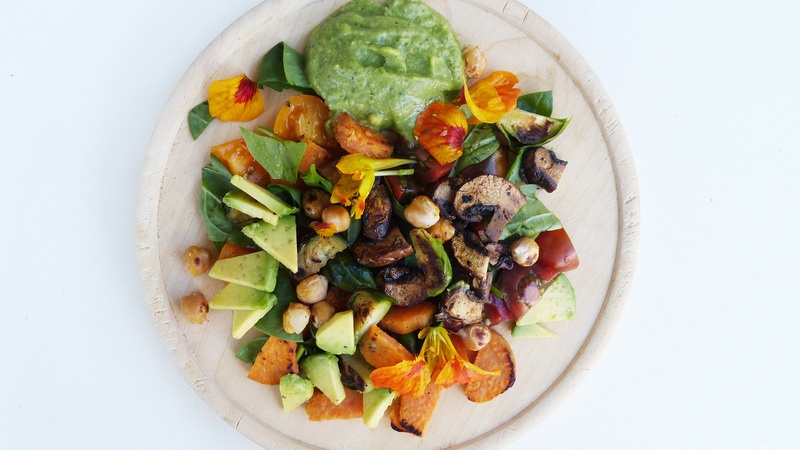 Try this roast veggie medley with chickpeas recipe. 1. Boil sweet potato on the stove until almost soft. Remove and run under cold water, then set aside. 2. Blanch Brussels sprouts until slightly tender. 3. Prepare vegetables as per ingredient list (slice, cube, halve). 4. In a pan, heat coconut oil and add mushrooms, sweet potato, Brussels sprouts and chickpeas. Pan roast until golden brown, adding more coconut oil if needed. 5. Combine with the fresh ingredients (tomato, spinach and avocado). 6. Serve with avocado dipping sauce.